We need water. It seems not only a basic, but an obvious and easily available thing to pretty much anyone in the first world. It is even listed as a human right by the UN. However, with fresh water being a distinct minority in the global water total, and unevenly spread with respect to human populations, a variety of questions are raised about what may be done to secure the future of water supply and processing. Not least to how toilet design has, and perhaps should, evolve. And while the apparently uneven distribution of clean water is undramatic for a lot of people, it belies a rather obvious and serious set of questions: one of them concerns processing water, but another concerns testing water to demonstrate whether it is clean at all. A given body of water may look and smell safe, but how safe it is microbiologically is not necessarily clear. A variety of water-borne diseases blight various parts of the world (cholera, Dengue fever, bilharzia, polio and too many more to mention) and many of these regions do not have suitable facilities for examining water supplies. This leaves a gap in the market for a method of testing water that is reliable, simple and transportable. One ingenious method, towards which Villalobos et al. have made significant steps in their research, involves the polymerisation of a lipid called TRCDA. Applying ultra-violet light to water containing TRCDA and live pathogenic species gives rise to a polymerisation reaction between the TRCDA molecules (Figure 1) that in turn results in a colour change from blue to red. The emission of the red colour is proportional to the presence of the number of such species and falls within the visible range so can be observed with the naked eye. It is also possible to make a quantitative measure of the change using a visible light detector similar to that in long-established techniques like immunosuppressant assays and chromophore-detection MS. The latter is possible because the polymerisation reaction gives a conjugated unsaturated system not dissimilar to that found in red- and orange-coloured vitamins. Figure 1. When TRCDA (three molecules either side of the phosphorus-containing lipid present) is treated with ultra-violet light for only a few seconds, a polymerisation reaction occurs that gives rise to a clear colour change. The polymerisation reaction gives a conjugated unsaturated system not dissimilar to that found in red- and orange-coloured vitamins. Diagram courtesy of . However, chemical techniques such as this are inevitably sensitive to interference, with issues surrounding the presence of metal cations (calcium, magnesium etc.) that are common in clean drinking water, as well as pH and temperature fluctuation[3,4]. Villalobos et al. have also sought to work around this problem with a more rigorous method development, including the inclusion of a well-established chemical method of removing metal ions, by chelation with an agent called EDTA. 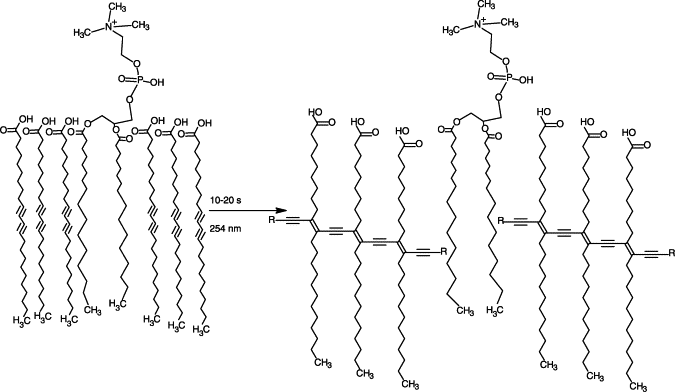 The use of a technique based upon TRCDA also offers scope for investigating the bacterial presence in foods; however the methods have not yet been developed to do so, and significant challenges remain for that application. For example, some methods use a Phage to detect and control bacteria present in foods, something not compatible with a measure of the presence of all pathogens . Despite this, the scope of this system remains strong, especially in situations where interference from other contaminants (such as metal ions) will be low. Surely a commercial format of this method is within reach? P. Villalobos, M. I. Chávez, Y. Olguín, E. Sánchez, E. Valdés, R. Galindo, M. E. Young, Electronic Journal of Biotechnology, 2011, 15, article 5. C. Valenta, A. Steininger, B. G. Auner, European Journal of Pharmaceutics and Biopharmaceutics, 2004, 57, 329–336. N. Charoenthai, T. Pattanatornchai, S. Wacharasindhu, M. Sukwattanasinitt, R. Traiphol, Journal of Colloid and Interface Science, 2011, 360, 565. C. E. D. Rees, C. E. R. Dodd, Advances in Applied Microbiology, 2006, 59, 159-186.